The young falcon that fledged on June 14, 2015 was spotted today. All four juveniles fledged between June 11 and June 14. Two landed on the ground pretty quickly and are now in summer flight camp for a little while to practice their flying skills. One youngster has been getting in a lot of practice near home base. The fourth chick did a disappearing act after fledging on Sunday. 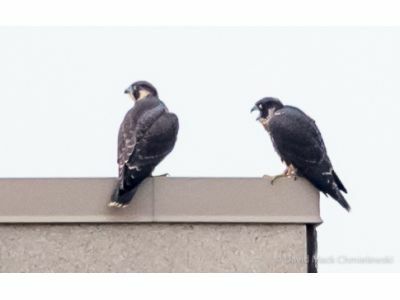 He was spotted today along with his more agile sibling and parents on the roof of the medical school. The parents certainly knew where the youngster was, even if we humans did not. Kewpee delivered some food to Rebecca who then took it to the hungry fledglings.